If I really love you, I'm more interested in you being connected to your voice than mine...knowing that will sometimes be hard for me. I will feel cherished knowing you would choose an awkward moment over a false one. This mindset got me into The Columbia School of Journalism and turned me into a prize-winning reporter managing her own sense of invisibility crusading for the disadvantaged. I actually was offered a job at The Times when I was 25--about the same time The Universe offered a competing option: An assignment to write an exposé of a spiritual group gave me an unexpected glimpse of feeling whole--independent of any achievement or anyone’s particular affection. When an admired editor told me I had written something “incredibly mediocre,” and astonishingly, I felt no familiar diminishment, I promptly left journalism and decided to spend the rest of my life exploring ways to embody the identity that made such an unimagined thing possible. Having spent much of my life “trying to connect,” it was relieving when I eventually learned how staying connected to myself in The Other’s force field took the “trying”--and much worry--out of relating. A psychotherapist now for over 25 years, I see myself as a kind of transpersonal scout, helping people let go of external structures that no longer fit and orienting them to what it means to structure a life based on their own insides. While I was learning psychoanalytic theory at Hahnemann Medical College, I was also studying Buddhism and secretly teaching clients to meditate. The tension between solid developmental approaches and my draw to the Mystical has been part of my journey. For years I taught Law of Attraction classes to Main Line moms, but understood enough about unconscious programming to consider The Secret as not telling the whole story. Personal growth, to me, examines the interplay between family-of-origin conditioning and one’s understanding of how The Universe operates. Many of us operate as if we are living in an Unfriendly Universe. 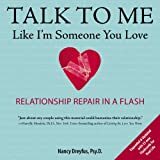 . . and my hope is that my guidebook, Talk To Me Like I’m Someone You Love will show you how—right in the messiness of life—to feel both discomfort and Something Friendlier in the wings. I believe that we are all just beginning to learn what it means to be fully human . . . that we have many different parts, and the trick is to feel these parts without losing our Inner Grown-up. I believe I bring clarity and heart to the therapeutic process, and that my openness about my flaws and limitations will serve my clients and readers as well as my strengths. I live, think and practice in Bala Cynwyd, Pennsylvania. I'm a good match for: individuals longing to feel real to themselves....partners figuring out how to be true to themselves in a committed relationship....corporations genuinely interested in supporting people being real in the workplace.....therapists wanting to integrate their formal training with their own metaphysical bent. I am peacefully divorced, have a 28-year-old daughter in Oregon and continue to practice walking my talk with the people The Universe puts in front of me.